The IBM model M is the best and most unique feeling keyboard I've ever typed on. The condition is excellent especially considering it is 28 years old. All the keys are working and fully functional, none of the keys feel inconsistent with the rest of the board. Not a cheap keyboard by any means, but it is built with a real commitment to quality. 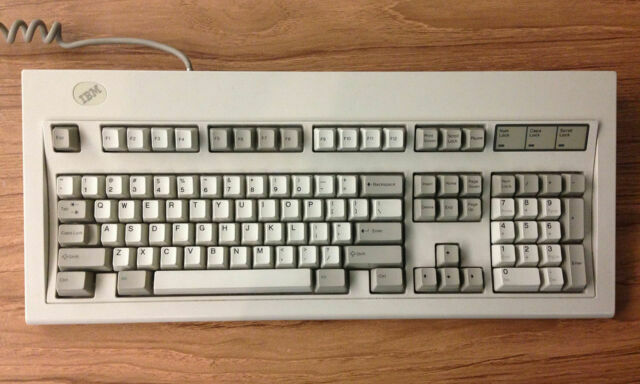 A typist keyboard, the model M is the predecessor to ALL modern keyboards. The buckling spring technology used to create this keeb provides a crisp, tactile button press that even with modern topre and cherry designs, are still relevant and unmatched. As they are quite bulky, they were truly built to last. Don’t live with regret, buy one for yourself. Best keyboard for my typing style. If you type with a significant amount of force, you will enjoy this keyboard. The tactility is second to none and the auditory feedback is great. I tried out an older model F IBM keyboard for awhile to see if I liked it or not. I did; I loved the loud "clacking" sound the keys made and how they felt, but the key layout on those is quite a bit different than current keyboards, so I looked on ebay and found a "clicky" model M. Modern keyboards get their basic key layout from the model M. BTW - model F kbds are "clacky," and much louder than "clicky"! These are such good keyboards to type on. Yes, they make some sound when you are typing but they were made SO much better than most of the kbds you can buy today. Highly recommended but be diligent in looking for a used one; it's easy to miss replaced or missing keycaps and stuff like that. But well worth the effort to find a good one!